I was looking for something a little different to do with the rhubarb bounty this year when I came across a fruited pudding cake recipe in the Favorite Recipes of America – Desserts cookbook from 1968. 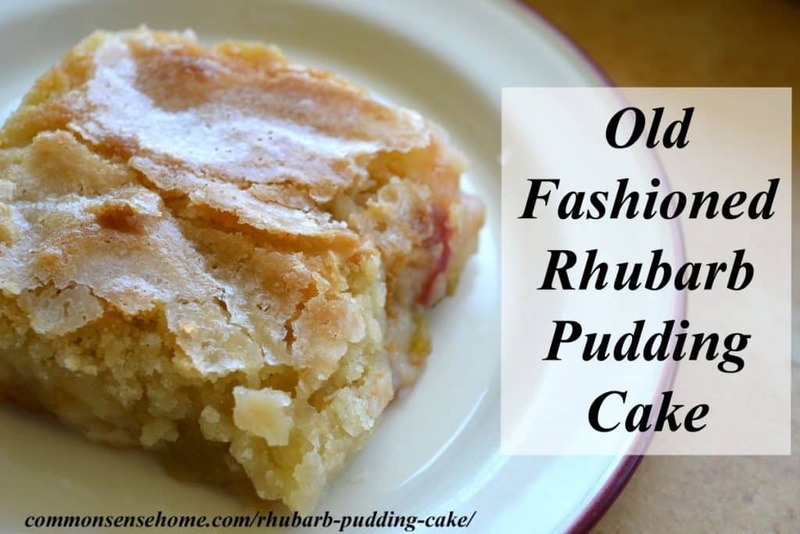 The original recipe calls for “any fruit, fresh or canned”, so I figured “Why not rhubarb?” Thus, this old fashioned rhubarb pudding cake was born. The recipe is quite sweet, even with the tartness of rhubarb. You could cut back a little on the sugar in the sugar/cornstarch mix if you like. This rhubarb pudding cake recipe has a delicate sugar crust, and rich custard pudding bottom. It's easy to make using fresh or frozen rhubarb, and can also be made gluten free. The boys are not huge rhubarb fans, but they loved this recipe. This is the sort of thing my grandmother would have made. I hope you and your family enjoy it, too. Bake at 375°F for 45 minutes. Yield: 9 servings. You can see that the sugar topping creates a glaze on the top of the cake, something like a creme brulee, as well as creating the pudding at the bottom. Serve warm in a bowl with ice cream, or let it cool a bit, slice and invert on your plate to show off the pudding. You may also substitute a gluten free flour blend, such as Namaste Gluten Free Flour. With the Namaste flour, I bake an extra ten minutes. Get more seasonal recipes, plus information on gardening, natural health, preparedness and weekly deals when you subscribe to the Common Sense Home newsletter. Shares and Pins always much appreciated if you enjoy the recipe! 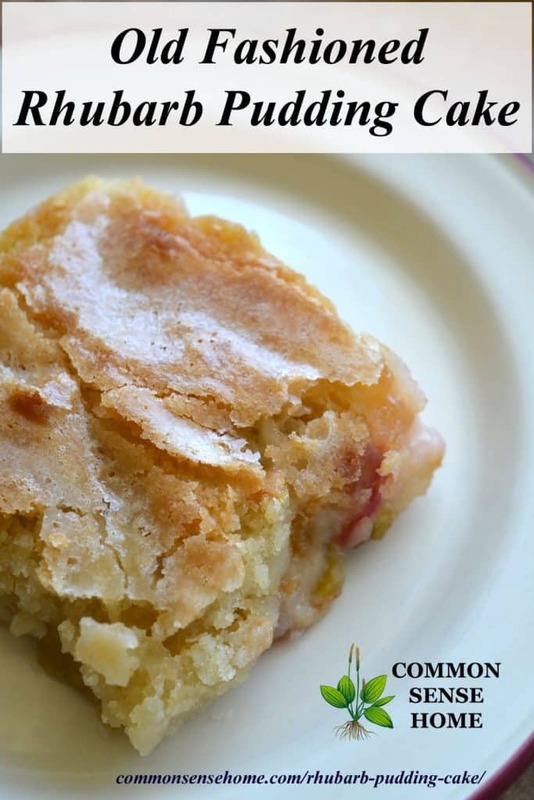 This rhubarb pudding cake recipe is easy to make using fresh or frozen rhubarb. A simple hot water trick allows the cake to make its own sauce while baking. Mix 3/4 cup sugar, butter, baking powder, salt, extracts, milk and flour together (add a little more milk if it is too thick to pour); pour over fruit. Mix remaining sugar and cornstarch; sprinkle over mixture in pan. Pour boiling water over the top. Bake at 375°F for 45 minutes, a little longer for gluten free flours. Yield: 9 servings. Note: You may also substitute a gluten free flour blend such as Namaste Foods Gluten Free Flour Blend. If using gluten free flour, add 10-15 minutes to bake time. You can watch me make the rhubarb pudding cake in the video below. 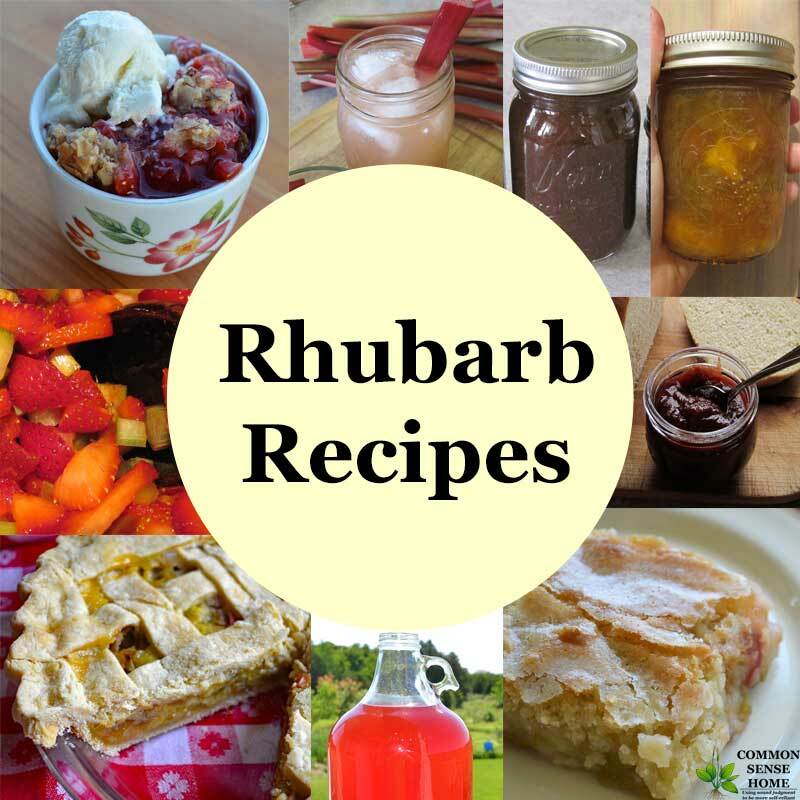 These recipes work with fresh or frozen rhubarb, so you can enjoy them anytime you have a taste for rhubarb and a supply on hand. Originally published in 2012, updated in 2015, 2018. There seems to be some mistakes in the recipe. the one I got emailed to me didn’t have vanilla or almond extract on it . Also on both this page and on the emailed one it says to Mix 3/4 cup sugar, butter, baking soda, salt, extracts, milk and flour together (add a little more milk if it is too thick to pour); But there is no baking soda listed on the ingredients . Are we suppose to add baking soda or baking powder? I don’t know if the baking powder is possibly the culprit. I have a recipe for the cakey type “cobbler”, and it uses 3 tsp of baking powder. It is easy at 1c. flour, 1c. milk, 1c. sugar, a stick of melted butter, 3 tsp baking powder. Mix and then add the fruit. Now it calls for canned fruit so there is juice so if you use fresh fruit you have to mix the fruit with sugar ahead of time so there will be juice. Not sure how it will work with rhubarb. It has a cake and glue affect also but tastes really good. Sorry about that, Heidi. I was in a hurry this morning and trying to do too many things at once. The recipe has been corrected. No baking soda, only baking powder (I had baking soda in my head with another recipe). 1/2 teaspoon each vanilla extract and almond extract. I will have to try that when I can get some rhubarb again. No one seems to grow it around here, and I only rarely see it in the stores. Growing up, it was everywhere, and Mom, being Norwegian/Swedish, had all KINDS of recipes involving rhubarb. The original recipe said any fruit, but I think plums or tart berries would be good alternatives to rhubarb. I just made this with blueberries! So good!!! Thanks for the recipe. I wish I could grow it here in the south I think it is to hot for it to grow here but I sure wish I had access to it. I would love to make this recipe. Yes, rhubarb needs cooler temps to thrive. Maybe another fruit like tart cherries would work almost as well? I have seen rhubard in the fruit freezer section of my grocery store. It’s not super common, but it does freeze well and frozen rhubarb works just fine in this recipe. I grow it in Ky and we have very hot weather and it does well. Friends here in Huntsville, TX grew it this year until the floods hit and drowned all but one plant in 2 feet of water. I think it could only survive as an annual because we don’t have cold enough winters to make it a perennial. I got some before the rains hit and it was delicious. Publix has it frozen…..and sometimes fresh! The original recipe can be doubled, but you’ll need to add extra baking time. I priority mail my mom rhubarb from Iowa to texas,and she receives it well. I wrap the sticks in wet paper towels then seal either with my seal machine or just seal good in gallon baggies. She just loves it and freezes it,so she has rhubarb whenever she wants it. I get several batches a year from my plants. Love finding new Rhubarb recipes. Good to know it holds up to shipping. We have made this three times in the last month. So very good.We already have the berries and peaches lined up for a little variety. Thank you so much for posting this recipe. My mom used to make this for us when we were children and now that I have my own rhubarb plants I was hoping to find the same recipe she used. This is the closest I have found so excited to get baking it again. Why does it look like you’re using unripe rhubarb? When we harvest ours, it’s a deep red all the way through. There are different varieties of rhubarb that have a range of colors. Most are more green than red, even at maturity. Depth of color does not indicate ripeness. I am so glad to find this recipe. I had lost my mother’s recipe and this is just the best ever. Thanks for sharing. The most delicious rhubarb recipe I ever made! Everybody loves it. Thanks. I agree! Such a dleicious pudding, I have made this with the tinned black Dorris plums. Absolutely Devine! My mom did a lot of rhubarb spread, too. Grandma was more into coffee cakes and such. So far everything I’ve tried just takes the edge off the itching or soothes it for a short time, but I’m going to keep trying internal and external remedies. While researching, I was surprised to discover how widespread psoriasis is, and how bad it can be for some people. I even saw a guy on youtube using a Brazilian wax kit to take scales off his legs – ewwwwwwww. That has to hurt! There are oral medications that inhibit the immune response, but those have a long list of side effects. The most commonly recommended treatment by most physicians is steroid cream, but that usually only works for a short time before it flares up again. This may be a long journey. Glad you enjoyed the newsletter! A note to Margie Harris and Laurie Neverman…On psoriasis…. If you can find someone with a ‘kangen water machine’ made by enagic in your area, that will share the water and the medicinal water with you it will totally get rid of your psoriasis. You will also need the 2.5 acid , 11.5 alkaline and 6.0 acidic water that it makes. I have seen it over and over again, and never seen this fail. There is a protocol for the use of the medicinal waters that you have to use directly on the psoriasis. If you email me and can find someone to share with you I will tell you how to do it. On the recipe…. I am so looking forward to trying this…. I have rhubarb coming out of my ears! how do I get the book…Common Sense Homesteading 101? I receive these newsletters but have never gotten the book. Don’t you need my address? Check your inbox. 🙂 I should probably send the link out again for others who may have missed it. I got this recipe somewhere last year and could not believe how easy it was. I passed it on to neighbours who made it. Their families asked for more. And didn’t usually. One them came to me for it again yesterday as it was requested for today’s, Father’s day, dinner. I am making it today too. If using frozen rhubarb, should it be thawed first? Thawed or partially thawed should both work. Just bake a little longer if it’s only partially thawed. How can I tell when my rhubarb is ready to use. The plant is huge but I am not sure when to cut and use it. This is just the second year for the plant and I cut it back in fall. Help! This is one of our favorite recipes. New rhubarb almost ready. This recipe is delicious and addictive! I use rhubarb right out the freezer, without thawing, and it works just fine. Can u double this & put it in 9 x 13 for a potluck! Yes, we double it all the time. Thank you! I’ve been scrolling reviews looking for this very question/answer. I’m feeding a docking crew today and a 9×9 pan just wasn’t going to cut it. Can’t wait to try it! I’m sure either of those would work well. I made this tonight using rhubarb from my garden. I cut down a little on the sugar. My tip is make sure the fruit is FULLY covered with the pudding mix or the fruit will leak out during cooking. I added just enough boiling water to put all the pudding mix just under water. It was simple and delicious. I think you could use almost any fruit. I made this yesterday, substituting whole wheat pastry flour, 1 tsp cinnamon instead of almond extract, & reduced sugar. Delicious! Probably about 5 minutes longer. I am trying this recipe for Easter as my mother in law cant have strawberries but likes rhubarb. Looking forward to a new recipe thatsxalso easy, yeah! On another note i saw your post bout psoriasis just a suggestion to try goat milk soap, my sister started making it to help her daughter with eczema which she doesnt have anymore. If are interested in trying it but cant find it near you let my know my sister sells it. Best Wishes and Thank you for the recipe. I’ve used goat milk soap for some time now and prefer it, but thanks for thinking of me. I make this for my husband who is diabetic. I use Truvia in place of sugar, unsweetened Almond Milk for the milk and soy flour for the flour. It does not spike his blood sugar. I have made it with rhubarb, rhubarb and strawberries, blueberries and with peaches. All were very good. Thanks so much for this! I was scrolling through the comments to see if anyone has tried a milk alternative. I am going to try it with my vanilla soy milk and margarine. I hope it turns out! Becky, how much Truvia did you use in place of the sugar? Thanks! When using a sugar substitute like Splenda – is the sugar amount still 1:1? Wow, that was really good and soooo easy! I’m not one that really likes warm fruit desserts, but I had a bunch of rhubarb I had to use. I’m glad I used it on this! Thanks for the recipe. I just saw this delicious looking recipe today on FB (surprise!). I have family who cannot have gluten (thanks for the suggestion of gluten-free flour) and no dairy. I have to be so careful with the ingredients but would love to try this this summer! So two questions, what would you suggest as a butter replacement? For the milk replacement, almond milk may work brilliantly and sugar replaced with Agave. I think I’d opt for coconut milk over almond milk if you can tolerate it, because of the higher fat content. As for a butter replacement, ghee would be my first choice if you’re only avoiding lactose, palm shortening if you must avoid all dairy (Tropical Traditions has an organic palm oil that is responsibly raised and harvested, which I reviewed here). Coconut oil would be my next choice if you don’t have either of the above, but the other two give a texture more similar to butter, from my experience. In my experience, in most cooking & baking, water is a perfectly reasonable replacement for milk. Since most of the expensive alternates still don’t have the protein that milk does, it doesn’t act the same in recipes (it’s not usually due to fat, or skim milk wouldn’t work). For my family, the only reason to cook with almond or other milk alternate is for the flavor, which in this case you probably wouldn’t even notice. Oh thank you for sharing this! I have lots of rhubarb in my yard! I can’t wait to make it! Maybe tonight or tomorrow for company! Yum! When you reduce the sugar (which I’m thinking of doing since we tend to like things not overly sweet), where do you reduce it? In the batter or the topping or both? What do you recommend reducing it to for someone who is interested in reducing it? I’d probably cut back a little in both. Just be aware that the sugar is responsible for that crackled crust and proper browning of the recipe. Laurie – have you ever tried xylitol or coconut sugar in this recipe? I am just wondering in either or both would be a good substitute for the white sugar and still achieve the top crackle and browning. No, I haven’t tried them, but I’d love to hear how they work out if you do. I just tried this using coconut sugar in place of white sugar. I still reduced the amount of sugar, since I don’t like things overly sweet. It is delicious, it has a crackled appearance, but the coconut sugar gives it a darker brown appearance throughout, as compared to the online picture. (since it is a brown colored sugar). My neighbor happened to give me just enough rhubarb to make this recipe . So glad I stumbled upon it, as I was looking for something a little different. How much sugar did you end up using? Thanks for letting me know that it worked out. Your welcome Laurie and Dawn! I didn’t have white sugar on hand and have been mostly using coconut sugar these days, since I heard it has a lower glycemic index. I think I did use just under 3/4 cup in the batter and just a little bit less than 3/4 cup in the topping ( instead of the 1 cup). So, I just reduced it a little, but I will probably reduce it more next time. It did not seem overly sweet with the amount I used, though. My husband thought it was really good . I would say it definitely has a darker appearance though and I’ve never made it the other way, so not sure if the top is as it should be. Let me know what you think. I will definitely make this again using other fruit, since I don’t get rhubarb very often. Your recipe is EXCELLENT! We all love it here, thanks for posting it. Glad you enjoyed it, and thanks for leaving a comment. Tried this recipe and It was to die for…thanks..
Glad it worked out well. We grow Rubarb in Victoria Aus but it needs a good sun shade to limit not block harsh sun then goes beserk in autumn when temp comes down to the 20 `s C with some rain and heavy dews. Red Variety is sweeter than green, shows red flesh when cut, but harder to grow ( more delicate ) and needs regular watering. Tastes better straight from ground. I’ve been trying to get a patch of red started. One year it drowned, one year it froze, but this year I found a neighbor I can get a start from, so I’m hopeful we have a winner. Ok I had my students make this for a lab and 4/6 kitchens pans over flowed on to the bottom of the oven almost causing a fire alarm??? I am pretty sure most followed the recipe exactly. Does anyone use bigger pans?? Did you use 8×8 or 9×9 pans? The most commonly found size I’ve found while searching online for glass pans in the last couple of years is 8×8. My 9×9 pans are older and have become hard to find. 9×13 would be overkill, but an 11×7 pan would probably work. Did you grease your baking dish? Looks delicious, am making it this afternoon. Our rhubarb is plentiful this year. You don’t really need to, as the pudding won’t scoop out cleanly no matter what you do, but you can if you like. It may make cleanup a little easier. Turned out great! Tastes like my MILs Rhubarb Custard Pie, only its cake & much easier! Thanks for the recipe! Glad that is worked out well for you. Thanks for letting me know. Hi, I have only non stick pan not glass. Will that make any difference? I made this last week, soooo very yummy. Best rhubarb recipe I have ever tried. Easier than pie, more tasty. Made it just like the recipe said. I have this in the oven right now! Didn’t have butter, so used margarine, do you think that will work? I don’t normally use margarine, but it should make a cake. Just made this. It’s wonderful. My mom used to make an absolutely perfect peach pudding with the same recipe. I just never thought to switch out the fruit. Watching the sugar content of the fruits, I’m ready to experiment. Thank you! I have tons of rhubarb and I cannot wait to make this. I have canned rhurbarb made like a sauce, could this be used? If not i can get fresh… Thank you for your time.. I was searching through Pinterest to find a different rhubarb recipe since I have so much from my garden and I found you. I jumped up off the computer and started making it. I usually him and haw if I should try a recipe or not, but this was so easy and I had everything else. Well it just came out of the oven and it looks divine. Too hot to eat right now but I’m sure it will be like heaven. I love rhubarb and have other fruits in my garden also. Strawberries are on their second round and the blackberries are red and getting ripe. So my next try will either be with blueberries and blackberries or a mixed berry custard dessert. One thing, I was low on milk and I just had enough, I see that other ladies are substituting, but how about buttermilk? I have powdered, would that work also? Thank you for posting and I joined your newsletter, can’t wait to read it. I never make box cakes, always home made, old fashion and trusted recipes handed down. I need all the rhubarb recipes I can get my hands on so keep them coming. Oh my Lord, it is heaven…… I’ll be making another one because this won’t last an hour between me and my two boys. Thanks again.. I generally like the taste of buttermilk in recipes, especially paired with fruit, so I think that would work. Powdered has usually worked fairly well the few times I’ve tried it in the past, but there’s only one way to tell for sure. I made this recipe twice now and my guests have licked the bowl. Even my picky guests loved it. I was considering making it and taking it with me on a trip. Has anyone made this the night before it was served? How did it turn out? Thank you. It’s best hot out of the oven, but not bad the second day. The “pudding” gets soft set, but as long as you don’t cover it while it’s still hot, the top crackle will stay “crackly”. Everyone loves this recipe. Usually top it with a little frozen yoghurt rather than ice cream. Made it a little saucier and increased the water to 2 cups and only use vanilla. It’s perfect every time. Glad you enjoy it, and thanks for sharing your experience. Made this tonight. It was delicious! Thank you! I am going to try this as soon as I get some rhubarb. Looks delicious. Has anyone tried this with a strawberry rhubarb combination? I love this combination in pie, so I’m thinking of trying this recipe with those fruits together. I haven’t (the rhubarb is awfully good alone), but I’m sure it would be delicious, as I do make a strawberry-rhubarb crumble, and jam, too. This is one of our favorite recipes. New rhubarb almost ready. This recipe is delicious and addictive! no eggs , right????? Just put it in the oven… hope that is right. Can’t wait to try it…. thanks. Mine was a little pastey…. I did bake it a little longer than the 45 minutes… I didn’t think it was quite done, maybe I overbaked…. Also I used a larger glass pan, so I did 1 1/2 recipe, so who knows…. was probably something I did. Husband didn’t complain… he loved it. I made this last night. Did not care for it while warm. The next day. Wow. Wonderful flavor. Thank you for this recipe. Going to try with different berries also. Glad it was a winner the next day. We like it both ways, but it is amazing how much it changes once it cools. I am making an assumption that I don’t have to use almond extract?! I did see that I can use my frozen rhubarb. Plan to make tonight/tmrw. But wanted to ask about the almond extract because neither of us like it. No, you can substitute vanilla instead if you prefer. Made this last night for dinner with gluten-free cup-for-cup flour. Delish. Second helpings all around. Love having a recipe without strawberries to enjoy that rhubarb taste. Even my husband who typically skips desserts had seconds. No ice cream needed here! Thanks! Glad your family enjoyed it, Joan. I think you meant to say it is 4 servings not 9 ;o) I can’t wait to make it this weekend! You can make it as many servings as you like, as long as you enjoy it. This took 5 minutes and we all loved it. Thank you! Loved this recipe. Making it for thesecond time in two days. Used freshly grated nutmeg in rhubarb and just used vanilla for flavouring. Think I will try this frozen mixed fruit. Glad you enjoyed it. Thanks for taking time to comment. This is a very close recipe to my Aunt Sylvia’s Blueberry Pudding – this being a bit better (more precise ratios, etc.). By the way – you can use ANY fruit in the bottom – fresh or frozen – and add a spice or lemon if the fruit suggests it. Thanks for this great update on an old family favorite! I used this recipe last summer. It was GREAT . This year I’m using half rhubarb and half strawberries. It’s in the oven now, I’m sure it will be just as good!! My neighbor made it with strawberries and rhubarb and said it turned out great. 🙂 Glad you enjoyed it. I just made this with strawberries and rhubarb, myself! I grew up eating “blueberry batter cake” which is essentially the same as this pudding cake with blueberries. I have found, through the years, that frozen fruit sometimes yields more sauce than fresh (which we prefer). I found your recipe after making the change to the blueberry recipe that I have. The recipe differences are the addition of the extracts, 1/4 less sugar for the topping, and 1/4 cup more boiling water. We prefer to pour cream or half and half over the top while it is warm and then eat leftovers the next day cold and straight from the pan. Thanks for sharing. I LOVE rhubarb and am baffled at why so many readers had strange outcomes. I’m wondering if they varied the recipe. Adding cream sounds yummy. We often eat our with yogurt or ice cream. I have it in the oven now. Didn’t see to reduce the sugar in time. Hope it’s not too sweet. So easy. I can’t wait to try it. Everyone’s tastes are different. Many enjoy the recipe “as is”, too. Great recipe. Followed the printed recipe, no deviations, and it was a hit. It’s a keeper. Fantastic recipe – husband and kids loved it. Great use of our endless supply of rhubarb! Have you ever doubled the recipe? Does the chemistry all still work well? Glad you enjoyed it. Yes, I’ve doubled it in a 9×13 pan and it works fine, although it may take a little longer for the center to cook through. I made this last weekend, so delicious! I got confused and put the whole 1 3/4 cup of sugar in all at once along with the baking powder. Wrote myself a note to divide up the sugar next time. I should have read the recipe more thoroughly but I will make it again when rhubarb is in season next year. I’m glad it was still tasty, even with the mistake. It also works well with stone fruits, like peaches or plums, if you happen to have some of those frozen. I added apple pie spice and it was the perfect compliment. So good! So glad that it worked out well for you. Thank you for letting me know. Instead of putting the cup of sugar and cornstarch on top of the batter, can “turbinado sugar” be sprinkled? I’m sure that wouldn’t be bad, but I don’t know exactly how it will turn out. If you try it, can you stop back in and let me know how it turns out? This was a lovely dessert, but way too much sugar for my liking. How would one cut the topping sugar in half, and would the water need to be decreased accordingly? The texture was lovely–just sweetened the rhubarb more than I care for…. Maybe try cutting the sugar in the batter to 1/4 cup, the sugar in the topping to 1/2 cup and the boiling water in the topping to 2/3 cup. Love Love Love this! Super easy pudding cake! Super yummy and it’s so awesome how it makes it’s own crust!!! I will be making this again!!!! I want a bigger cake. Can you double this & use a 9X13 pan? Yes, you can double the recipe. You may need to increase your cook time by 5-10 minutes. Can the recipe be doubled to use a 9×13 pan? Made this tonight & my family ate the whole thing. It’s safe to say I’ll be making this again. Glad that your family enjoyed it, and thanks for letting me know. I can see why kids would like this as it is more sweet than rhubarb—rhubarb is several flavors down on the list, I’d liken it to a rhubarb flavored cream donut—cream and donut coming on top, then rhubarb. The recipe notes it could use less sugar—one cup alone for the “crust”—I used larger crystal decorative sugar and that allowed for a lot less sugar. So yes, this is an easy to make and it tastes good but I would think a reworking aimed at bringing forward the tart sense of the rhubarb would make this a great recipe. Although this recipe is a keeper, it is WAY TOO SWEET. The recipe, as written, at 2 cups rhubarb, has way too little fruit for the 1 cup amount of sugar for the pudding part. I made it exactly as written the first time and nowhere near enough rhubarb. I’ve made it twice now using 4 cups of rhubarb and it is MUCH better that way. To accommodate the thickening needs of the extra fruit, I bumped up the cornstarch to 1 1/2 tablespoons total and it worked great. Can tapioca starch (tapioca flour) be used instead of corn starch? I have not tried it in this recipe, but if you do, I’d suggest two tablespoons of tapioca starch. Love this easy and very tasty recipe. I use almond milk and oil in place of butter (being vegan). Turns out great every time. Glad to hear you can use frozen rhubarb and other fruit as well. We have a bumper crop of rhubarb this year. Glad that it worked out well for you, even with the changes. Hi Laurie, Just wondering if the recipe has been corrected? ‘m not sure if I’m aware of all the changes that were needed. Thanks! The recipe is accurate as currently displayed on the site. Some people have been sharing different adjustments they’re using to make it dairy free or reducing the sugar. This was so easy and so delicious. Thank-you for the recipe! 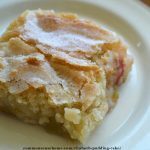 This is our favorite summer dessert–but I now have stockpiled rhubarb in my freezer, so we will enjoy it year round! Glad to hear that you enjoy it.